I spent the past few days testing and fiddling with the True Scale Couplers. I have them working great between cars, but engine to car is where the trouble has been. I think on the engine I'd have to 'weld' the two coupler halves together and trim the whiskers to allow it to swing more. Even then, there's only two spots on the 6 modules I've set up in the basement that has issues. Of course, in proper prototypical fashion I guess, one of them just had to be here. Any time the my old fuselage build came out at shows, the river jokes pour in soon after. They just wont drown. So here it is, let's all get it out of our system! Hey, looks like you got a Boeing FISHelage! Welcome to the Railwire. It is nice to hear from someone who is or was working at Boeing and is actually familiar with the subject. In a typical off-topic Railwire fashion I have a question: I have photos of larger-diameter fuselage nose and a center section being transported in a fashion similar to the 737 fuselages. What type of aircraft were those for? A 757 maybe? Are those still being transported by rail today? Another question: do you know what type of material is the white stuff used to cover the emergency exit doors, nose, area at the wing root, and front landing gear well? I've never paid much attention to the white material used to cover the doors and fuel tank section of the wingbox, but from some detail photos I have taken, it looks like a heavy sheet plastic, almost like 0.1" thick styrene. As for the nose and center section it likely wasn't a Boeing plane if it was larger than a 737. As someone else pointed out, the 707, 727, 737, and 757's are all the same width of 148", and while a mid and the cockpit sections are built by Spirit in Wichita, they are inside an oversized Skybox. McDonald Douglas did transport parts of the DC-10, including the nose section, by rail and that could be what you saw photos of. We are getting some very interesting, and different, cars and loads. Cars with turbine blades from MT, and another style of blades from Shapeways. Now cars with fuselages on them. I can't wait to see what is next, both from MT and Shapeways. Then it is probably a 757. Here are the photos I found. 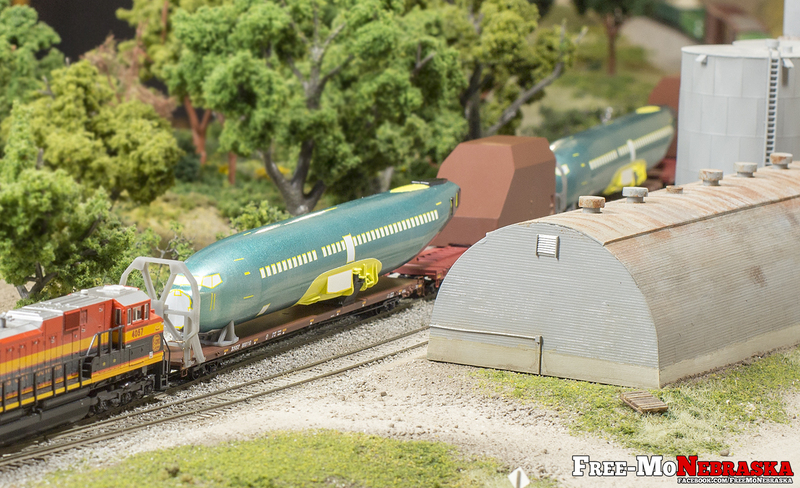 Those photos look to be older (since the fuselages are not coated with the darker green stuff). But they would make an interesting load in addition to the 737 fuselages. As far as you not being able to post photos, that might be related to your low post count. Once you reach 25 post you should be able to fully use the forum. Not sure about the mid-section piece, but the first phote (nose end) is indeed part of a 757. Those 2 photos appear to be taken of adjacent cars. Looking at the center section photo, to the right you can see the next car which is carrying the nose section which is shown in the 1st photo. So there is a very good probability that both sections belong to the same aircraft. To aid the conversation, various prototype aircraft component car images. Split fuselage 737 (???) cockpit and aft sections loaded onto flat cars fitted with brush guards. An aircraft stabilizer loaded in an open SP Skybox car. Lockheed Skybox Car SP 596366. McDonnell Douglas DCCX Well Car for wing transport. Added some more decals then took a break to just watch em' run. 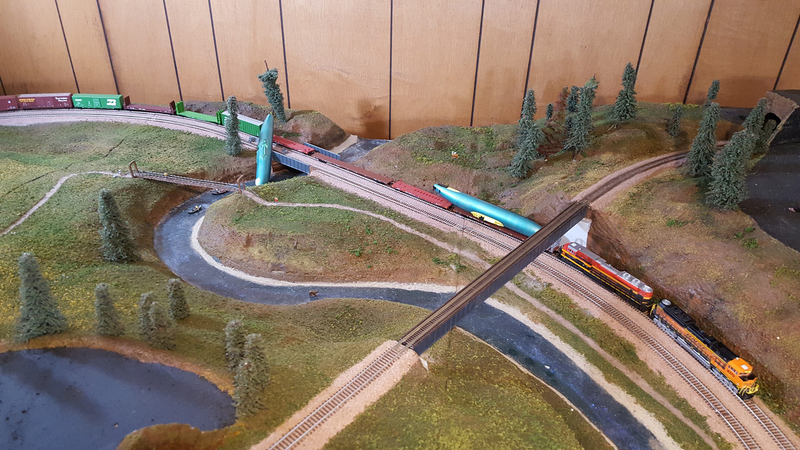 Curious, in the real world would these cars be in a regular mixed freight or in a train by themselves and are there any speed restrictions like trains pulling Schnabel cars. Yes Sir. Usually on the front end of a priority manifest train. Sometimes they run them by them selves as a separate train. I've only ever seen them on the front end of a mixed freight, coming through Lincoln. Then I just saw this video where they're mid-train. This was 2011 though, so I'm curious if since the derailment (2014) they're now required up front. Both, depending one what part of the journey they are on. Leaving Wichita to Kansas City, they are pretty much the only thing on the WICKCK, other than skyboxes. Most times they have a solo unit pulling them, and that power can be anything. From Kansas City to Spokane (KCKSPO) they are at the front of the manifest. 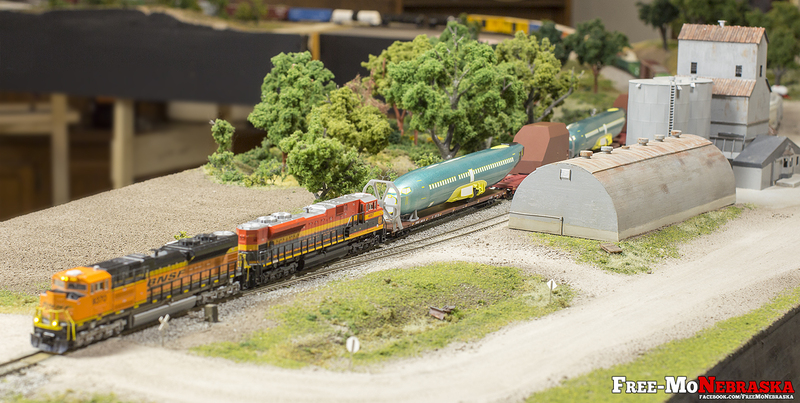 Both trains are limited to 40 mph speed restrictions because of the fuselages and a maximum of 4 fuselages per train. Back when I was building models of planes, ships, tanks, etc that seam along the top and bottom would have been sanded and filled. The nose has to be filled because it is a very large opening, but is anyone worrying about the fuselage top and bottom? Or is the seam not obvious enough to worry about? For the nose what I am thinking of doing is making sure it is completely flat then shaping a .005 piece of styrene and gluing it there. I spy a pine tree downside up at the start of this page . BTW I can only hope the A&Ps take as much attention to detail as you have taken with this project.